Accounts receivable funding is an excellent source of capital for businesses that are growing or experiencing a temporary cash flow squeeze. Accounts receivable funding, also known as factoring, is the sale of invoices at a discount. It is a method of financing that is used by businesses to raise capital quickly and improve cash flow without going into debt. Precisely when a business sells a product or service to a customer it creates an invoice. Typically, an invoice would itemize the unit sold, the price and the terms of the sale. The invoice can either serve as a receipt if it acknowledges that payment has been received, or as a bill if payment is due. An outstanding invoice may also be called an account receivable. Instead of waiting to collect payment, a business may elect to\ sell the invoice to a factor and receive immediate cash advance. 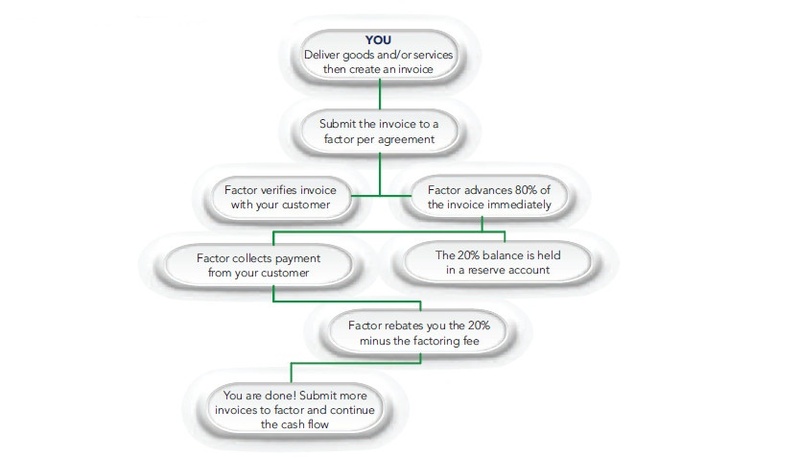 A factor is an individual or business that is engaged in the buying of accounts receivables. Factoring is simply another option of financing that businesses have. Factor funding should not be weighed against a bank loan option because a fund received through factoring is not considered a loan, legally or in practice. The fee is not considered as interest, it is a purchase discount. Attempting to multiply and annualize the discount rate may be well intentioned, but it is misleading. If you borrow $100,000 from a bank at 12% you could make monthly payments of $1,000 and in 12 months would have paid $12,000. Yet, you would still owe $100,000. If you factored $100,000 each month at a 2.5% discount, in 12 months your fees would be $30,000. However, you would have received $1,200,000 (12 x 100,000) and the fees would still be $30,000 total. With increased expenses and cost of factoring as a result of additional volume you would get a much higher percent of profit overall. Net profit increased from $4,008 or 4% to $29,559 or 14.8%. This is a significant increase. The core question is can you do more business with better cash flow? Fixed cost and overhead would not necessarily increase in proportion to sales. You may increase staff, but because your sales double does not mean you have to double overhead such as office space, utilities, or labor etc. Factoring fills the money gap and creates a predictable and dependable source of cash. Instead of waiting on payments from your customers for uncertain number of days, weeks and sometimes months, funds can be made available immediately each time you invoice. This will make cash available to meet payroll, pay rent, buy supplies and meet other operational needs. The factor will wait to collect from your customer. When the invoice is paid, the factor will retain a sum equal to the initial cash advance plus applicable fees. The balance is then refunded to you along with account statements. The exact factoring fee will depend on volume and time of payment. With factoring, a business owner might be able to completely avoid loans and other financing options that could restrict independence and the ability to operate freely and efficiently. Until recent decades, factoring was only available to large corporations that were able to meet the minimum threshold required by major factors, many of which were wholly-owned by or subsidiaries of banks. Today, factoring is available to small and medium-sized businesses, because there are now diverse factors and brokers that require no minimums or maximums. In most cases, no term commitment is required and your credit limit will be directly related to sales. The process can take anywhere from 3 - 10 days to establish an account. After which funding is often immediate, usually within 24 - 48 hours of submitting an invoice, and does not particularly matter what state you are located in. Factoring has evolved into a very fine financing technique for companies that are experiencing rapid growth or have other cash flow needs but may not qualify or want conventional funding. There are countless reasons why businesses factor, and many articles and books have been published about them. You may obtain a generalized benefits list by contacting Factor Funding. A perfect credit rating is not required to establish a factoring account. The single most important requirement to qualify for factoring is that you must be a registered business and have accounts receivable due by credit-worthy customers. It is the factor’s responsibility to verify your customer's credit worthiness. You can qualify whether you are a start-up or an already established and profitable business with credit problems, and even if you already have a loan or line of credit. Factoring sources are very diverse and several approaches may be used. However, there are two major types of factoring - recourse and non-recourse. Recourse factoring requires re-purchase guarantee by the seller who is ultimately responsibe for unpaid, disputed and fraudulent invoices. With non-recourse factoring the factor assumes total risks provided the invoice is not disputed. 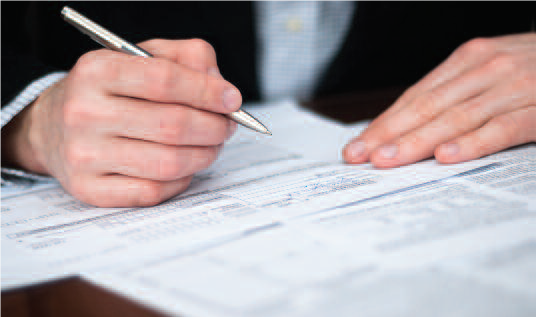 Regardless of what type of factoring, all agreements require a principal’s guarantee against committing fraud. Operationally, there is also factoring with notification and non-notification. Factoring with notification is where a seller's customer is notified by the factor and verifies the invoice. With non-notification factoring, the seller's customer is not notified and may not be aware of the factoring relationship. Non-notification factoring is largely available only through banks and institutionalized lenders. This is most likely due to volatility and market uncertainty as well as recent corporate shenanigans, which only the largest and best financed organizations can withstand. After an agreement is signed, a UCC-1 lien against all accounts receivable is filed. It is a blanket lien, and it is similar to a lien on a house that is against the entire home and not just parts of it. Accounts receivable is simply looked at as one of the assets of a business. Generally, most factors will gladly provide references and testimonials from satisfied clients. However, they do so sparingly only to serious prospects and with the consent of their clients, so as not to violate confidentiality agreements. MYTH: FACTORING IS ONLY SUITABLE FOR LARGE CORPORATIONS OR BUSINESSES THAT ARE IN EXTREMELY BAD FINANCIAL CONDITION. FACT: It is true that factoring used to be the exclusive domain of corporate giants. However, by share numbers alone, more small businesses than big corporations are factoring today. Almost any business can receive funding through factoring and the rates are very competitive. Factoring is not just for companies experiencing cash shortages. Most astute business managers use it in long-term planning and in conjunction with other revenue generation methods. It is increasingly becoming part of many businesses’ overall financial plans. MYTH: CUSTOMERS MAY HOLD A NEGATIVE VIEW OF YOUR COMPANY IF YOU FACTOR AND MAY SEEK ALTERNATIVE VENDORS. FACT: Being able to qualify for outside funding should speak volumes to your confidence and the confidence financiers have in your company and your customers. Business owners, more than anyone, understand the difficulty in securing outside funding. To have access to funds when you need it should put your suppliers and customers at ease because you will be better equipped to meet their needs at any time, even on short notice. Therefore, they’d prefer to continue working with you rather than seek another vendor. Approval to factor is usually based more on the credit worthiness of your customers than your personal or business credit. MYTH: FACTORS HOUND AND HARASS CUSTOMERS WITH COLLECTION CALLS, LETTERS AND NOTICES. FACT: A factor's goal is to enable you to continue to do business. Therefore, it is in a factor's interest to help you succeed. It's folly to think that factors would intentionally offend and harass your customers with collection calls. Additionally, without direct pressure, factors more often improve and enhance the collection process to the amazement of clients. This is because most businesses realize that their ability to secure more accounts can be directly related to their credit reports and references. The reports that factors might provide to business credit bureaus, such as Dunn and Bradstreet, may impact the ability of your customers to do business. Therefore, in order to have and maintain a good credit rating, they will pay on time. Factors do and sometimes call customers, but only as a reminder, rather than to harass a customer. Factors are more likely to successfully resolve payment issues in ways that would satisfy the client than the client would on their own. MYTH: FACTORING IS PROHIBITIVELY EXPENSIVE AND WOULD ABSORB ALL PROFIT MARGINS AND PUT YOU OUT OF BUSINESS. FACT: A generalized response given by a prospect that does not have complete details is that factoring is too expensive. 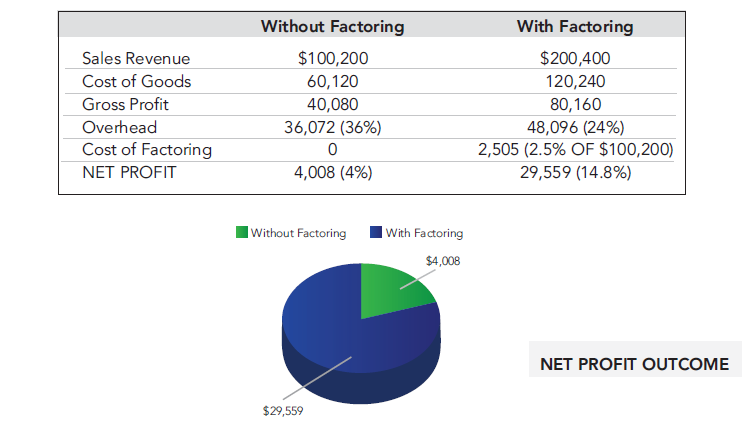 The cost of factoring is relatively favored compared with other financing. It can be relatively better compared to other types of financing, but can vary greatly depending on many conditions, not unlike bank loans. Most businesses would prosper with better cash flow. However, it takes more than just money to run a successful business. How well you grow your business and how much profit you can make would depend on a number of factors (no pun intended). It requires knowledge of your business, your skills, and abilities and so on. Numbers used here are for illustration purposes only. We make no guarantees that you will achieve the same results. You now have more information about factoring and we hope that you are better equipped to make an informed decision about the service. However, we are not engaged in rendering legal, accounting or other professional services. If legal advice or other expert assistance is required, you should seek the services of a competent professional. The methods of operations and specific processes may vary from one factor to another. Factor Funding Co. has been supporting small and medium-sized businesses seeking a better source of cash flow since 1996. If slow-paying customers are delaying your research and development, manufacturing, vendor payments, payroll or other cash needs, we can help you get the cash you need. As your financial partner, we will provide you with immediate working capital while assuming the timeconsuming task of collections. No “bugging” or harassment of your valuable customers is involved – just a commitment to turn your outstanding invoices into ready cash to help you achieve your business goals. Contact us today to see how we can help your business grow. Stay up to date with the latest tips and news on cash flow for businesses. Factor Funding Company is dedicated to providing cash flow to young and growing small to medium size businesses including start-ups, minorities, and women-owned businesses. You’re virtually approved if you sell on terms to other reputable and credit-worthy businesses or you have unencumbered tangible assets.